At ECS, we believe that girls' confidence, competence, and connectedness are developed through a varied and well-balanced approach to all aspects of school life. We provide our students with numerous opportunities to discover themselves academically, artistically and athletically. 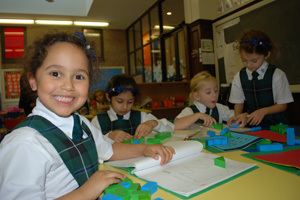 Every girl at ECS is recognized for her individual ideas, interests, abilities, needs and cultural identity, and is expected to contribute fully to building a strong and supportive community. Our outstanding faculty and staff members are committed to developing the critical thinkers who will become 21st-century innovators.